Calling all coaches, managers and umpires! Our annual District 32 Rules Clinics will be held on Monday, February 11 at the Mira Mesa Rec Center (8575 New Salem St.), OR Wednesdsay, February 13 at the Coronado Library (640 Orange Ave). The clinics will be the same at each site. You only need to attend whichever one is located more conveinetly for you. The clinics will run from 5:45-8:30 p.m. Whether you are a rookie coach or a veteran of several decades, the clinic will be an invaluable review of new rules, misunderstood rules and situations. All managers in our Intermediate and Juniors divisions who will be participating in District 32 Interleague play are required to attend the clinic. The clinic will be run by longtime umpires and District 32 staff members Dave Gillingham and Mark Smith. The clinic is free if you bring along a copy of the 2019 Rule Book. If you don't have one yet, you will be given a Rule Book and your league will be charged $5. Click on the Handout below for the latest Umpire Newsletter, from our District 32 Staff umpires Mark Smith and Dave Gillingham. In addition to great info for every umpire, there is a great rundown of the handful of new Rules & Regulations being implemented in Little League this year. You can also click on the UMPIRE NEWSLETTER heading above to go to Little League's story about new rules. 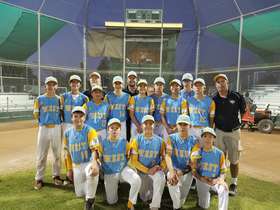 Scripps Ranch represented District 32 and the West Region in the 2018 Intermediate World Series Tournament. This tournament was played at at Max Baer Park in Livermore, CA 94550. 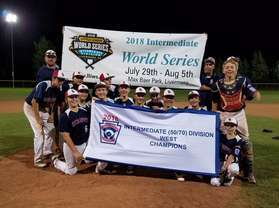 You can click on the words "2018 Intermediate World Series" above for a link to the final tournament bracket. With this game complete, Scripps Ranch has now finished their 2018 tournament run, the most successful in the history of District 32. Congratulations to all of the players, coaches and parents for representing your league and district in a way that will make us all proud forever! Congratulations to Scripps Ranch for winning the 2018 Intermediate West Regional Tournament. This tournament was hosted by Arizona District 8 in Nogales, AZ. You can click on the words "2018 Intermediate West Region" above for a link to the official tournament bracket. 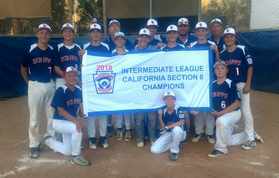 With this win, Scripps Ranch advances to the Intermediate Division World Series, July 29-August 5, which is played at Max Baer Park, 1310 Murdell Lane, Livermore, CA 94550. Their first game in the World Series will be Sunday, July 29 at 3 p.m. against the champion from the Central Region, Ankeny National L.L. (Ankeny, IA). 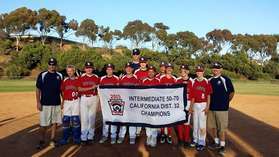 The 2018 Intermediate Southern California State tournament was hosted by District 63 at Saticoy Little League (1198 S. Saticoy Ave., Ventura, CA 93004). Click on the words "2018 Intermediate State" above for a link to the final tournament bracket. Congratulations to to Scripps Ranch, who with the win becomes he Southern California Intermediate All Star champions for 2018! 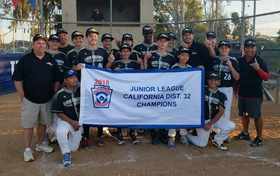 They will now go on to represent Distrct 32 and Southern California in the West Regional tournament in Nogales, AZ. Their first game will be Thursday, July 19 at 5 p.m. against the champions of Northern California. The 2018 8/9/10-Year-Old Section 6 All-Star Tournament is being hosted by District 70 at Rancho Buena Vista Little League (600 3/4 Optimist Way, Vista, CA 92081). Click on the words "2018 8-10 Section" above for a link to an updated tournament bracket. With the loss, Coronado's tournament run comes to an end. Congratulations to this team on not only their success, but for representing their league and district with class. Congratulations to North Park, 2018 Section 6 9-10 All Star Champion. North Park will now go on to represent Section 6 at the Southern California State Tournament, beginning with a game at 3 p.m. on Sunday, July 22 at Corona National Little League. The 2018 9/10/11-Year-Old Section 6 All-Star Tournament was hosted by District 33 at Serra Mesa Little League. Click on the words "2018 9-11 Section 6" above for a link to the final tournament bracket. Congratulations to Allied Gardens, 2018 Section 6 9-11 All Star Champion. 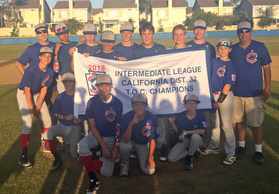 Allied Gardens will now go on to represent Section 6 at the Southern California State Tournament, beginning with a game at 4 p.m. on Sunday, July 22 at Temple City American Little League. The 2018 Little League (Majors) Section 6 All-Star Tournament is being hosted by District 31 at Escondido American Little League (Jesmond Dene Park, 2401 N Broadway Ave, Escondido, CA 92026). Click on the headline above for a link to an updated tournament bracket. Congratulations to San Carlos, 2018 Section 6 Little League All Star Champion. 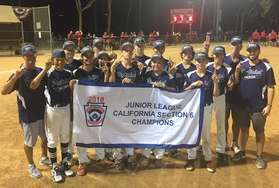 San Carlos will now go on to represent Section 6 at the Southern California State Tournament, beginning with a game at 3 p.m. on Saturday, July 21 at Aliso Viejo Little League, against Park View Little League. The 2018 Intermediate Section 6 All-Star tournament was hosted by District 32 at Scripps Ranch. Click on the headline above for a link to the final tournament bracket. Congratulations to Scripps Ranch, champions of the 2018 Section 6 Intermediate All Star tournament. Scripps Ranch will now go on to represent District 32 and Section 6 at the Southern California state tournament, being hosted by District 63 in Ventura. 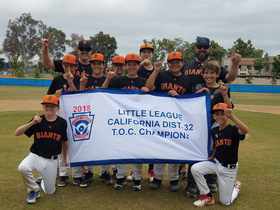 Their first game will be Saturday, July 7 at 2:30 p.m. at Saticoy Little League, 1198 S. Saticoy Ave., Ventura, CA 93004, against the champion of Section 1 – Coast Little League (District 65). 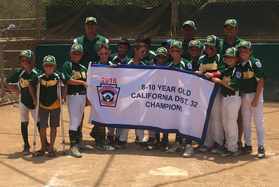 The 2018 Junior Section 6 All-Star tournament was hosted by District 32 at the Rancho Penasquitos Little League field. Click on the words "2018 Junior Section 6" above for a link to the final tournament bracket. Congratulations to Patriot American, champions of the 2018 Section 6 Juniors All Star tournament. Patriot American will now advance to the Southern California State tournament, being hosted by District 13 in Thousand Oaks. Their first game will be Sunday, July 15 at 3 p.m. against the champions of Section 5. Good luck! The 2018 8/9/10-Year-Old All-Star Tournament was hosted by Rancho Penasquitos Little League. Click on the words "2018 8-10 All Stars" above for a link to the final tournament bracket. Congratulations to Coronado Little League, Champions of the 2018 District 32 8-10-year-old All Star Tournament. Coronado will now go on to represent District 32 in the Section 6 tournament, which is being played at Rancho Buena Vista Little League (600 3/4 Optimist Way, Vista, CA 92081). 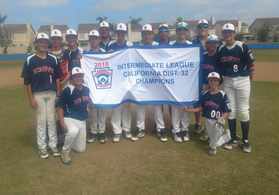 Their first game will be Saturday, July 14 at 12 noon against Rancho Santa Fe, the champions of District 31. The 2018 9/10/11-Year-Old All-Star Tournament was hosted by Presidio Little League (Sefton Field, Hotel Circle Place, SD 92108). Click on the words "2018 9-11 All Stars" above for a link to the final tournament bracket. Congratulations to Rancho Penasquitos National, 2018 District 32 9-11 All Star Champions. RP National will now go on to represent District 32 in the Section 6 tournament, being hosted by District 33 at Serra Mesa Little League (Cabrillo Heights Park - 3393 Kearny Villa Rd.). Their first game will be Saturday, July 14 at 2:30 p.m. against Allied Gardens, the District 33 champion. The 2018 Little League (Majors) All Stars Tournament was hosted by Scripps Ranch Little League. Click on the words "2018 Little League All Stars" above for a link to the final tournament bracket. Congratulations to Point Loma Little League, Champions of the 2018 District 32 8-10-year-old All Star Tournament. 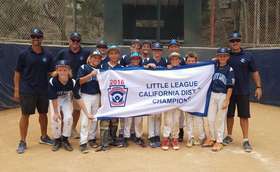 Point Loma will now go on to represent District 32 in the Section 6 tournament, which is being played at Escondido American Little League (Jesmond Dene Park, 2401 N Broadway Ave, Escondido, CA 92026). Their first game will be Saturday, July 14 at 10 a.m. against San Carlos, the champions of District 33. The 2018 Intermediate All Star Tournament was hosted by District 32 at the Mira Mesa Little League fields. Click on the words "2018 Intermediate All Stars" above for a link to the final tournament bracket. The 2018 District 32 Juniors All-Stars Tournament was hosted by University City Little League. Click on the words "2018 Juniors All Stars" above for a link to the final tournament bracket. Congratulations to Rancho Penasquitos, champions of the 2018 District 32 Juniors All Star tournament. Rancho Penasquitos will now go on to represent District 32 in the Section 6 tournament, which will begin Saturday, July 7 at the Rancho Penasquitos fields (Canyonside Park, 12350 Black Mountain Road, San Diego 92129). Their first game will be at 4 p.m. against the champion from District 31. The 2018 Minors Tournament of Champions was hosted by District 32 at the Mira Mesa Little League field (8575 New Salem St., San Diego 92126). Click on the words "2018 Minors TOC" above for a link to the final tournament bracket. 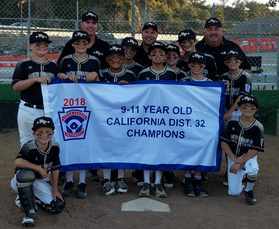 Congratulations to the Rancho Penasquitos National Padres, who are the winners of the 2018 District 32 Minors Division Tournament of Champions. 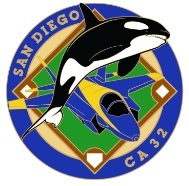 The 2018 Majors Tournament of Champions was hosted by District 32 at the Mira Mesa Little League field (8575 New Salem St., San Diego 92126). Click on the words "2018 Majors TOC" above for a link to the final tournament bracket. Congratulations to the Scripps Ranch Giants, who are the winners of the 2018 District 32 Majors Division Tournament of Champions. 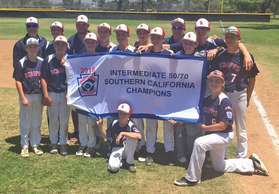 The 2018 Intermediate Tournament of Champions was hosted by District 32 at the Mira Mesa Little League field. Click on the words "2018 Intermediate TOC" above for a link to the final tournament bracket. Congratulations to the Scripps Ranch Cubs, who defeated Point Loma in an amazingly well-played game by both teams to win the 2018 District 32 Intermediate Division Tournament of Champions. 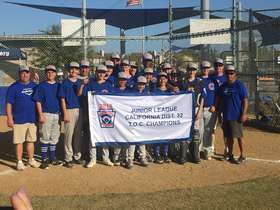 The 2018 Juniors Tournament of Champions was hosted by District 32 at the Mira Mesa Little League fields. Click on the words "2018 Juniors TOC" above for a link to the final tournament bracket. Congratulations to the Rancho Penasquitos Cubs, who defeated Peninsula in a beautifully pitched game by both teams to win the 2018 District 32 Juniors Division Tournament of Champions. The Easton Ghost X 30/20 5/8 bat has been decertified by USA Baseball, and is no longer legal for use in Little League play. This action. affects only this one specific model, in this one specific size, and all other bats with the USA Baseball label are still legal for use. Receiving a notice that a bat has been decertified, especially in the middle of the season, is challenging, inconvenient, and disappointing for everyone. On Thursday, May 3, USA Baseball informed Little League and other youth organizations about the decertification of the Easton Ghost X 30/20 5/8. We are committed to sharing that information with all of you as soon as we received it. According to the official notice from USA Baseball, "official compliance testing determined that the Ghost X 30/20 exceeds the performance limit set by the USABat Standard. Per the USA Baseball Youth Bat Performance Test Protocol as well as (USA Baseball's) contracts with Easton, these results constitute a non-compliant bat that must be decertified." For any family or league that is impacted by USA Baseball's decertification of the Easton Ghost X 30/20 5/8, we strongly urge you to read Easton's release, which includes information about how to return your bat to receive a $500 voucher for Easton.com. For the USABat Standard, bat manufacturers are required by USA Baseball to have their bats certified by following the protocols set out by the standard. Once a bat is certified, additional compliance testing is done to make sure that the bats remain complaint with that standard. Little League® International has no role in bat testing or compliance testing. Once a bat that is currently in the marketplace and available for purchase fails to meet the performance standard, it is decertified, and pursuant to Rule 1.10, is an illegal bat. Little League does not decide whether a bat meets, doesn't meet, or no longer meets the performance standard. Bats used for Little League play in all divisions must remain compliant to the applicable bat standards, as explained in the current year's rulebook (Rule 1.10). Through LittleLeague.org/BatInfo, as well as Little League's social media and email efforts, we are committed to sharing any information about the decertification of bats as soon as possible, so that all our families and volunteers know which bats are permitted and which bats that may have already been sold are no longer approved for play. Again, we apologize for any inconvenience, and we strongly encourage you to visit LittleLeague.org/BatInfo for complete information about how bat standards impact all divisions of Little League and resources on which bats are approved for Little League use. For all information pertaining to the USABat Standard, visit USABat.com. For those parents and leagues who purchased the Easton Ghost X, 30" -10 USA Baseball bat (model #'s YBB18GX10 30/20 & LL18GHX 30/20 Japan model), we, again, encourage you to read Easton's release and contact them as soon as possible at 1-844-531-7079, or ghostreturn@easton.com, to return your bat and receive your $500 electronic voucher. 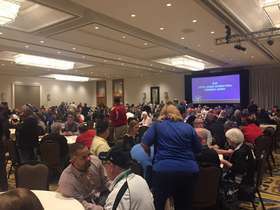 Delegates to the 27th Little League International Congress, completed January 22nd in New Orleans, voted on 13 potential rules and regulation changes, with 11 of them voted in, approved by the Little League Board of Directors, and to be implemented for the 2018 season. Seven of these new rules and regulations go into effect with the start of our 2018 regular seasons, two will apply to tournament play, and one tournament rule (with a local league option for regular season) is still being finalized and we will expect a further update on that. One rule affects only softball programs. A rule affecting the enforcement of manadatory play during tournament action is under further review, with an expectation of final decisions prior to the start of this year's tournaments. For more complete descriptions of of the rules approved, along with complete records of District Administrators' vote totals from Congress, click on the Handout below. Want to join District Staff? Ever wonder how things get done? If you do, then you might just be the person we are looking for. We are always looking for volunteers who love and believe in Little League Baseball. As you should know, things don't just happen, it takes hours and hours of hard work from volunteers. Our staff oversees 11 local leagues with more than 4000 Little League players. The players need your help; they can't do it without all of the adult volunteers. We are serious about our role in the Little League organization and have a good time while supporting what we believe in. If you are interested in joining, please let us know. Send an email to llapage@san.rr.com and let us know what you are interested in. Play Ball! Challenger Division  The Best Part of Little League! Come See A Challenger Game Soon! The Challenger Division of Little League Baseball is a program for mentally and physically disabled youth to enjoy the full benefits of Little League participation in an athletic environment structured to their abilities. The program is available to any special needs child between the ages of 5-18, or who is in an ongoing high school program up to the age of 22. More than the skills of baseball are learned through the experience. The value of the Little League Challenger Division is found in the proven therapeutic and socialization benefits of participating in sports, the strengthening of participants’ self-esteem, the opportunities to mainstream into other divisions of play, and the disciplines of teamwork, sportsmanship and fair play which are hallmarks of the Little League program. The philosophy of the Little League Challenger Division is to provide the framework so that every Little League program may offer a structured, athletic activity for all youth in the community. Challenger Division participants learn not only the fundamentals of baseball, but also how it feels to be just like other children pulling together as a team, being cheered, and earning awards for their achievements. 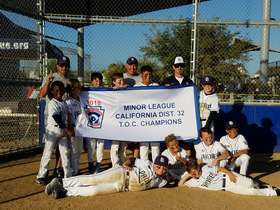 Currently, District 32 has Challenger Division teams in four of its leagues (Mira Mesa, Rancho Penasquitos, Peninsula and University City), with hopes to expand the program to all of the other leagues in our District as well. Like Our District 32 Page On Facebook! Get updates on all the District 32 news by becoming a Facebook Fan! Over the past couple of years, there has been a lot of discussion about the Little League Baseball Age Determination Date. This is an important topic to everyone involved in Little League, and the Little League International Board of Directors has now decided to change the Age Determination Date for all divisions of Little League Baseball and the Little League Challenger Division to August 31. In 2014, Little League District Administrators initially voted to move the age determination date from April 30 to December 31, effective with the 2018 season. That was amended by the Little League International Board of Directors in August 2015, moving the date from December 31 to August 31. For players born on or before April 30, 2005: The new age determination date of August 31 will be effective starting with the 2018 Little League Baseball Season. For the 2016 and 2017 seasons, these players will use the April 30 age determination date. For players born between May 1, 2005 and August 31, 2005: The new age determination date of August 31 will be effective starting with the 2019 Little League Baseball Season. For the 2016, 2017, 2018 season, these players will use the April 30 age determination date. For players born on or after September 1, 2005: The August 31 age determination date will be effective immediately, starting with the 2016 season. This was the implementation used for the 2015 season, with players turning 4 to 9 years old during the 2015 calendar year to use the December 31 age determination date. That implementation remains in place, except instead of using December 31, you will use August 31. 5 visitors have signed our guestbook.